This Christian movie is the second installment of the popular movie series about The Chronicles of Narnia. This specific installment is my favorite of all 3 movies made about the magical world of Narnia. As I mentioned before in my review about the first Narnia film The Chronicles of Narnia: The Lion, the Witch and the Wardrobe, this movie series is inspired by the book series written by C.S. Lewis. The Pevensie siblings are back and are set to embark on a new adventure back in the land where they once were kings and queens. 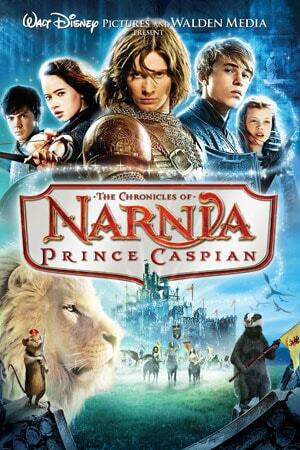 The Chronicles of Narnia: Prince Caspian takes us to Narnia as the Pevensie kids go back and they are given the task to restore the kingdom from the hands of a terrible king and give it to its rightful heir, Prince Caspian. More than 1,000 years have passed in Narnia and only one year in Britain, where the Pevensie siblings are from. We meet Prince Caspian, Telmarine royalty and the rightful heir to the Narnian throne. His teacher, Cornelius, informs him about his uncle Miraz’s plan of killing him and obtaining the throne for him and future heirs. Caspian’s mentor gives him Queen Susan’s ancient horn which she had used in the previous movie, and tells him that he should blow it when he is indeed in an eminent situation. Now Caspian from The Chronicles of Narnia: Prince Caspian has to escape from Telmarine soldiers and as he is chased by them in the woods he meets two dwarfs. As one of them approaches Caspian he stops in his tracks as he sees Queen Susan’s horn. In that moment Caspian feels threatened, he grabs the horn and blows it. Back in Britain, Peter, Susan, Edmund, and Lucy are at a train station waiting for their train. Suddenly the station’s walls begin to collapse and the magical land of Narnia appears in front of them. The siblings are ecstatic to be back but they realize that it doesn’t look the same as it did the year before when they left Narnia. They soon see Cair Paravel, the castle where they were crowned by Aslan which is now in ruins caused by attacks with catapults. There they take their weapons back which were in a safe place since they were last there. Now let’s go back to Caspian. He is taken by the dwarfs to Trufflehunter, the badger’s home. There Caspian explains how he has no intention of harming any Narnians. Back in the woods, we meet Reepicheep, a very courageous mouse, who is about to attack Caspian but he is told that he’s is for Narnia. Reepicheep is actually one of my favorite characters from this second installment. And spoiler alert, he’s also in the third movie! Back in Telmarine quarters, the council knows of Caspian’s escape and his uncle Miraz is aware that he has been taken by the Narnians. His council takes this as a joke since Narnians aren’t supposed to exist but he presents one of the dwarfs I mentioned earlier as evidence. Miraz tells the council to attack any Narnians in their way as they take Caspian back but in the back of his mind, he already knows that he intends to kill him. 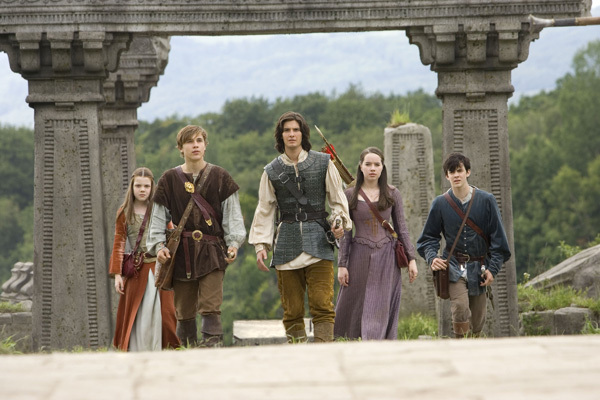 Now in The Chronicles of Narnia: Prince Caspian the Pevensies meet Caspian and all of them head to Aslan’s How, which is a cave below the hill where the stone table was in the first film. At first, Peter wants to attack Miraz’s castle but Lucy thinks its best to wait for Aslan to come back. Tensions begin as they all are somewhat divided in what to do. Later on, Miraz and his army arrive at Aslan’s How and Caspian has an idea. It’s sort of dangerous but his idea is to have Peter and Miraz duel to the death so that Lucy and Susan can find Aslan. Miraz, not wanting to look like a coward, agrees. Susan and Lucy while looking for Aslan are confronted with trouble as Telmarine soldiers are chasing them. Now in the battle, Peter defeats Miraz and his life is spared but when an arrow from Susan’s bag is thrown to Miraz and kills him a battle forms in revenge from the Telmarine’s. Now there’s even more trouble for the Narnians and Aslan is nowhere to be found. At this point in the film, we are on the edge of our seats as we await to see how this story unfolds. If you’d like to know what happens next, find the film in www.fishflix.com.